Cub Scouts is the largest of the three BSA Scouting Divisions (Cub Scouting, Boy Scouting, and Venturing) and was officially founded Nationally in 1930 as part of the Scouting program. However as early as 1911, Ernest Thompson Seton had developed a prototype program he named Cub Scouts of America that was never implemented. James E. West felt that having BSA divisions for younger boys would draw away boys from the core program, which at the time was Scout troops focused on the 12–17 year old age group, thus he opposed such a program for some time. In spite of this, unofficial programs for younger boys started around this time, under names such as Junior Troops, Cadet Corps. As early as 1921 the City of Piedmont had a pre-Cub Scout program known as the Boy Pioneers. In 1916, the BSA obtained the rights to World Scouting founder Robert Baden-Powell's The Wolf Cub Handbook and used it in unofficial Wolf Cub programs starting around 1918. This led to an issue with Daniel Carter Beard who felt that the use of the British book was disloyal to the United States of America. James West encouraged the formation of the Boy Rangers of America, a separate organization for boys eight through twelve based on an American Indian theme that also used the Scout Law. The BSA finally began some experimental Cub units in 1929 and in 1930 the BSA began registering the first Cub Scout packs. The initial rank structure in 1930 was Wolf, Bear and Lion (ages of 9, 10 and 11) with dens of six to eight Cubs that were entirely led by a Boy Scout holding the position of den chief. All Cub Scouts belonged to the Webelos tribe, symbolized by the Arrow of Light and led by Akela. Initially Webelos was also an acronym meaning Wolf, Bear, Lion, Scout. It has since come to mean "WE'll BE LOyal Scouts". Below is a summary of important dates of Cub Scouts. 1918 - James E. West, Chief Scout Executive, secures the rights for the American printing of the British Wolf Cub's Handbook for sale to U.S. Wolf Cub packs. 1921 - The City of Piedmont organizes a Boy Pioneer program for younger boys. 1924 - The National Executive Board proposes "adoption of a younger boy program at the earliest date, it should be kept entirely distinct from Scouting and prepare boys for graduation into the Scout movement." 1927 - A portion of the $50,000 Rockefeller grant supports a research and development project on the younger boy program. 1929 - The National Executive Board approves demonstration Cub units. 1930 - The National Executive Board approves the Cub program "controlled experiment" as of February 10. The board authorizes Cub packs to register with the BSA starting April 1. Uniforms for boys are issued ($6.05 complete) and 5,102 boys and 1,433 pack leaders in 243 packs are registered during the first year. 1933 - "Experimental" restrictions were removed on May 25th and “Cubbing” would be aggressively promoted as a part of the Boy Scout program. 1936 - Registration of den mothers made "optional"; before this year, den mothers not permitted to register in Scouts..
1941 - Webelos rank created for 11-year-old boys with the Lion badge. 1942 - Boys allowed rank corresponding to their age if they entered into the program late (no need for catch-up). 1945 - "Cubbing" changed to "Cub Scouting." 1949 - Age levels for Cub Scouting changed to 8, 9, and 10, with boys entering Boy Scouting at 11. At the end of the 20th year, for the first time Cub Scouting has more than a million boys registered at some time during the year, a 25 percent gain over the previous year. 1953 - First pinewood derby is held. Don Murphy of Cub Scout Pack 280 in Manhattan Beach, California founds the idea. 1954 - Webelos den created for 10-year-old boys. 1955 - Pinewood derby becomes official part of Cub Scout program. More than two million Cub Scouts are registered during the year for the first time. 1965 - For the first time Cub Scouting breaks through the three-million mark for boys registered during the year. 1967 - Cub Scout advancement program overhauled. Lion rank discontinued in favor of new Webelos Scout program. 1972 - Cub Scouts account for 51 percent of BSA youth membership. 1976 - Women could now serve as Cubmasters and assistant Cubmasters. 1978 - Five ranks established in Cub Scouting: Bobcat, Wolf, Bear, Webelos, Arrow of Light Award. 1982 - Tiger Cub program is introduced for the youngest of the Cub Scouts. 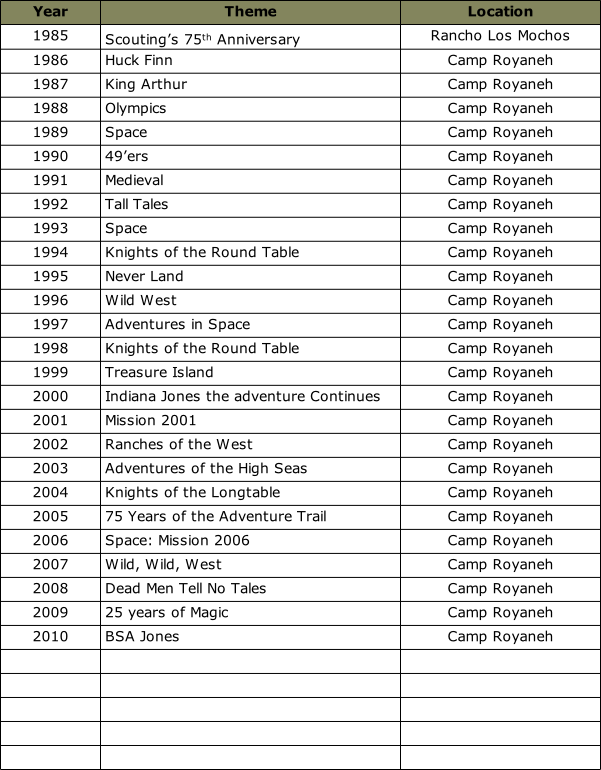 1985 – Extended camping approved for Webelos Scouts (Adventure Camp). This week long program was developed for the SFBAC in 1985 by Candi & Wayne Llano, Vince & Mary Gagliardi and Doug Olsen. The week long adventure which is open to all first and second year Webelos was first located at Ranchos Los Mochos but moved to Camp Royaneh in 1986 where it has been held ever since. Each year the Adventure Camp has a different theme that is used to focus on completing various Activity Pins, sports Pins and Belt Loops. 2010 - Cub Scouting celebrates its 80th Anniversary.